I sit here tonight thinking about my dad. I think back to just a few weeks ago and see this man driving my mom wherever she needed to go on her errands....I see him sitting at his desk working on the computer...I see him printing out pictures of his grandchildren...and his one great grandchild...making them large enough so that Mom, with her macular degeneration, could catch a glimpse of them all. Right now he lies in his hospital bed hooked up to a machines....including one that breathes for him...an ileostomy that collects his body's wastes...a feeding tube that gives him nourishment....etc. etc. I have just changed my flight home to Sunday instead of Monday. The reason is that the family doctor is going to sit down on Sunday afternoon and talk to the five of us together....Mom, my three sisters and me. We are going to talk about things like "quality of life" and "recovery" and whether there are "decisions" to be made. "Decisions"? That is so surreal to me. How can we make "decisions" concerning this man who brought us up? He is the parent...shouldn't he be making the "decisions"??? I can hardly believe these words that I am writing. I never imagined being in this position. I don't want to be in this position. So much of this is falling on my mom's shoulders. She needs to know that we are all behind her no matter what. Here is a little addendum to yesterday's post. There is a wonderful site called "Eat Better America" that is a great way to "healthify" one's meals. While I thought that I had invented that word...I now find out that they have a section on htis site where you send in your recipe and they will "healthify" it for you. It is filled with delicious recipes and informative articles on living a healthy lifestyle. Weight management is also covered...and, with that excruciating time of year---bathing suit season--- quickly approaching...Well, you women out there feel my pain. In a constant quest to make the food that I eat as healthy as possible, last night I decided to try my hand at "healthifying" (probably not a real word-but it gets the point across!) 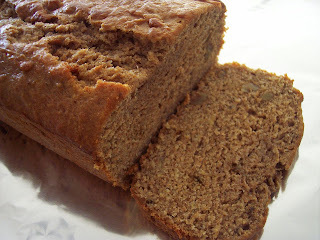 a basic banana bread recipe. Truth be told, I had about 8 very overripe bananas that were calling out to be used for something good instead of being thrown away. To begin with, I used nice, rich whole wheat flour instead of plain white flour. I cut the whole cup of sugar down to a half and used a little Splenda to make that half. Instead of a cup of oil, I used mostly applesauce with a little bit of the oil....egg whites, instead of whole eggs...I added some chopped walnuts (nuts are the new health food these days) and then regular amounts of cinnamon, nutmeg, baking powder and baking soda. I was quite proud of myself and as I poured the thick batter into the loaf pan....I envisioned writing a new book...leading to a guest spot on Oprah called: "Healthified Cooking with Grammie"...(a girl can dream, right?) Oprah would make it her Book Club selection and I would make my first million soon after that! Reality hit as the timer went off in the oven. So, fifty-five minutes later as I took the banana bread from the oven I was amazed at the wonderful banana bread aroma that filled the kitchen. The outside texture looked good even though it felt a little heavier than other breads that I have baked. After cooling down, the moment of truth arrived. I slowly cut into my healthified loaf-- finding it a little resistant to getting the knife through it. "Ah, it is so nice and rich", I thought to myself. It was a little totally tough to chew. It was a little unbelievably dense. This banana bread turned out just like a very heavy banana-flavored brick!!!!!! As my dad continues to slowly heal in intensive care in a hospital in Florida, thoughts of him never leave my mind. He continues to amaze us all--including the doctors and nurses--with his determination to recuperate from three serious surgeries. While he is not out of danger at this point, we continue to be hopeful as he makes baby steps towards his recovery. Yesterday he went an entire day without the use of the breathing ventilator! The doctors are trying to do this weaning process with cautious optimism as they do not want to wear him out. Instead, they want some of that energy to go towards his strengthening his body to get better. They are keeping him very sedated these days, so he is sleeping most of the time. My family down there tells me that he does occasionally open his eyes...but is not really responding like he did before. This is probably the most difficult part for us right now...the inability to have him truly communicate with us. The feeding tube is still in, and his getting the proper nutrition continues to be an issue. Every day brings new possibilities and new things to try. His doctor has not given up and says that he will use every tool that he can and try everything that he knows to help Dad get through this. This doctor is such a special and loving man and we are so appreciative to have him as Dad's caretaker. I have made reservations to head back down to Florida next Monday through Friday to stay with my mom and go back and forth to the hospital to see Dad. I look forward to holding his hand and letting him know how much I love him...and encouraging him to continue to fight this biggest battle of his life. 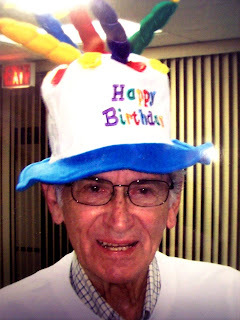 The picture that is posted today was taken 5 years ago at his 85th birthday. He was a good sport as he wore the silly hat that we gave to him. Today I was thinking that his 90th birthday is now just a few weeks away and we would love nothing more than to put that crazy hat back on his head as we celebrate together...again. Travel weary....as I headed home from Minnesota...and having just made the decision to head down to Florida the next day to be with my family after Dad's surgery...I did have a very special thing happen at the Birmingham airport. I had noticed people staring at and going up to a gentleman sitting in the Atlanta airport during our layover there. His back was to me...so, I didn't know who it was. My thinking was that it was possibly an athlete or public official? 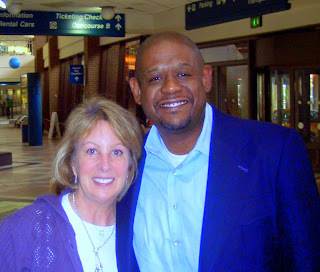 As the plane boarded I got a better look at this man...and realized that it was Forest Whitaker, the Academy Award winning actor whom I adored! Quite starstruck, I told him what an honor it was to be on the same plane with him as I passed him by in the first class section. As we landed in Bham and I headed for the luggage pick up area, I saw Mr. Whitaker approaching me from behind. Not to let this moment pass me by, I began to engage in conversation with him. We walked all the way to the baggage area together, continuing our conversation while awaiting our luggage. He was only going to be in our fair city for the evening before heading on to another stop...so I began to tell him some things about Birmingham. At this point, other passengers were beginning to watch us, probably wondering who this lady was engaged in conversation with this famous star. I decided that no one would believe me unless I had proof of this encounter....so, I summoned up enough courage to ask him if he would pose in a picture with me. I apologized profusely for the intrusion...but, he graciously accepted my request and the proof is below. He looks great in the photo...but, like I stated in the beginning...I was pretty weary looking at this point in the day. I have a new appreciation for this wonderfully talented, and kind, man. Who is this crazy man and why is he walking in the cold rain? Well, it was sunny when we decided to get our walking clothes on and head out for a brisk walk. Suddenly, that all changed as the sky darkened and the raindrops began to fall. Without letting that stop us (fools that we are!) --as the raindrops fell even harder....we grabbed our umbrellas and headed out. Sometimes you have to do something a little crazy to keep your sanity!?!?! 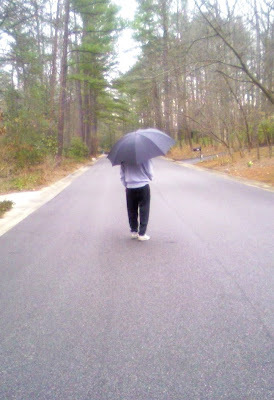 I couldn't resist snapping this picture with my cell phone of Dave walking down the long road with umbrella in hand. I wonder what the neighbors were thinking ????!!!! As Dave and I sat down to eat last night, I watched him as he looked over the little salad that I had prepared to go with our spinach and feta cheese frozen organic pizza. The salad was mainly romaine, radishes, and a few little sprouted green peas sprinkled on the top. He looked at me with a grin on his face and said: "Whole Foods?". 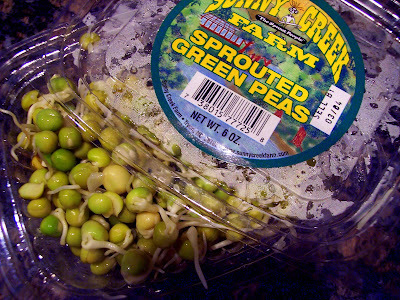 I had to laugh because I had been there that day...and, I did bring home a variety of out-of-the- ordinary foods...including the freshly sprouted peas...They were just so cute I couldn't resist. I don't go to Whole Foods that often in that the prices are so high there...but, when I do go...it is quite an event. I suddenly find myself mesmerized by 300 different types of olive oil...as well as a large enough variety of couscous to please any palate. And, all of the vegetables seem to beckon me to take them home and try them...some of which I haven't ever heard of before. But, they all look so fresh and colorful and appetizing....until I get home and realize that I haven't the foggiest idea how to prepare these delicacies. Thus, the reason that I put the little raw peas on our salads last night. A while back I carefully formed this vase out of my clay. I stamped textures into it and the letters H-O-P-E. I painted it with bright colors and filled the textured surface with a black wash. The vase went into the kiln for the first firing...and, unfortunately blew up. There were pieces of the clay all over my kiln. This can be caused by an air bubble in the clay....or, too much moisture caught inside the piece possibly from inadequate drying time. Instead of throwing it away, something made me piece it back together and fire it again with a coating of clear glaze. I wasn't willing to give up on it. I knew that I wouldn't be selling it, but instead decided to keep this imperfect piece for myself. If you look at the picture carefully, you can actually see the jagged lines of the pieces that were put back together. It caught my eye the other day as I recalled the journey that this vase had been on. The fact that it spelled out "HOPE" became very meaningful to me at this time. While my dad has so many things going against his making a complete recovery at this time, we all continue to have hope. He has amazed us all with his tenacity before...leading us to believe that he will slowly recover. Even though he is still in intensive care with tubes and wires connected to his body...he still remains a fighter. Just like the vase where each piece was carefully and lovingly placed back into its right position to make it whole again...my dad needs to slowly and carefully heal one part of his body at a time so that he can function again on his own. 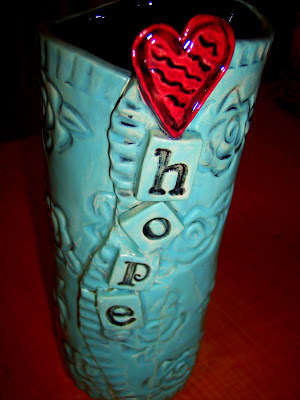 I keep looking at the stamped letters that form the word "hope". These letters stayed intact during the firing explosion....and continue to give me the encouragement that I so desperately need right now. I have mixed feelings about last night's American Idol. While this is an extremely talented group....no one really blew me away with their performances...but I did find it to be an enjoyable two hours. Again, the group this year seems to be very young...and, it was almost funny to me hearing them sing songs from "my time"....(you know, the "olden days"!! )...before they were even born. Well, if I have to pick....I would say that my favorites were: Brook White, who sang "So Happy Together"; Ramile Maluby, who sang "You Don't Have To Say You Love Me"; Asia'h Epperson, who sang "Piece of my Hear"; and Syesha Mercado, who sang "Tobacco Road". The "real" competition began last night...and, once again, I am hooked. If the twelve boys are indicative of the talent level this year....we are in for quite a show! I think that the young ages of many of these kids is what really amazed me. I didn't have anywhere near their level of maturity and composure when I was that young. 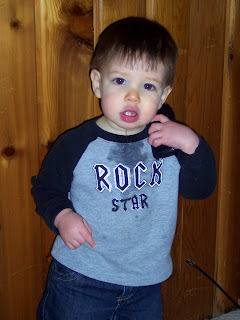 From what I recall, I was pretty much only interested in the latest styles of clothing and boys, boys, boys!!!! These young kids are writing their own music and belting it out before millions of people. It is not only impressive, but makes me feel quite ancient....and a bit inept. For the most part, I enjoyed them all...but my early favorites are: Jason Castro, who sang "Day Dreaming", Michael Johns, who sang "Light My Fire", and little David Archuleta who sang "Shop Around. David is cute as can be but got a little giggly and silly after his song. Oh well....I guess that he was actually just acting his age...17! I am looking forward to the girls turn tonight. The reactions to "I have a blog" are always different. Many people chuckle and say: "Why would you do that? Why put your feelings out there to complete strangers?". Some are concerned and ask: "Why expose yourself like that?". These people do not truly understand this mini world of "connections" that my blog has afforded me. Without my blog, I never would have been introduced to some wonderfully interesting people who make up this world we are all living in. No, they aren't famous....and they may not have done anything earth shattering during their lifetime. But, they are just good everyday people trying to make the most of what they have....taking on each day full of spirit and determination....loving their families...working hard....celebrating life...and, in some cases, dealing with challenges such as illness, divorce, getting older...etc. It is from these very people that I receive so much when I blog. Since my dad's illness and surgeries, a small group of my blogging friends have really been there for me...leaving loving and inspiring comments..sending emails....just letting me know that they have my dad in their thoughts and prayers. Today I want to dedicate my blog to some of these wonderful women: Beverly, Beverly,(my two Beverly's!!) Claudia, Stephanie, Paulette, Jana, and Stella. Your friendship means so much to me and continues to fill me with hope. 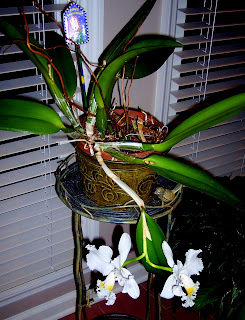 As I was walking in my sunroom this evening, I spotted my old orchid plant sitting in the corner. The branches have gotten gangly... and many of the once beautiful leaves have dried up and fallen off. Instead of being a small, tight plant, its leaves now spread out wildly in all directions as it seeks a piece of the morning sunshine from in between the wooden blinds. 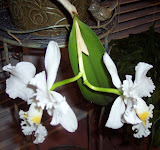 I remember when I first got this orchid and it was bursting with floral beauty. Once the flowers dropped off, I kept it in the sunroom and nurtured it through the years. Every once in a while it surprises me...like today. ...just the sign of hope that I was needing today. My posts have been quite heavy these last few days as I have had my dad's recovery on my mind....but, I thought that I might lighten up a bit tonight with a couple of pictures from my recent MN trip. Sitting here not really even knowing exactly what day it is...I am thinking about so many things. As my dad continues to be "stable" down in Florida, I find myself here in Birmingham counting my blessings...especially the gifts of love that I feel from my family. Dad's illness has changed us all forever. As we give him the necessary time to heal, we are all taking the time to discover so much about ourselves. My four sisters and I are so very different...it amazes me at times to realize that we all come from the same parents...as well as the same environment. We each deal with things in our very own way...and through this difficult period of time with Dad in the hospital...we are in the process of learning to understand and respect those differences. It's not always easy, but it is a journey that we are taking together....bound by the love, not only for our parents, but for each other. Collectively, we can be there for Mom. 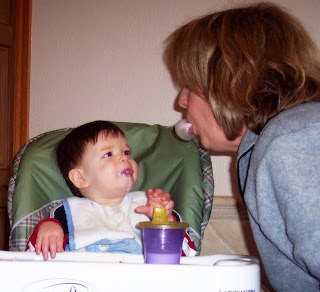 Mom, who is having to dig deep inside her soul right now to come up with strengths to get through each day. As she goes to visit her life partner of 65 years every day, she told me that she feels an intense sense of helplessness. I can't even begin to imagine what she is experiencing right now. She wants to see signs that he is improving and that he is not in pain...but can't always find those signs and leaves feeling weary and confused...and frightened. I know that she realizes that she isn't alone in any of this, however, she also recognizes that this is going to be a long, slow recovery period and that she must find a spirit of independence from within to keep going on with her life as it is right now. I see such a wonderfully capable and resilient woman in her...and I can only hope that she, too, will see and discover her own courage in the next days, weeks, and months ahead. While the "family" love can envelope her, she must also seek her own inner strength and wrap that around herself during her times alone. Anxiety again took hold last night as my dad went back into surgery for the third time in a less than two weeks. The perforated colon that had been repaired in surgery #2 was not holding and an ileostomy was called for. I am, unfortunately, learning more medical jargon than I had ever desired to as I sit and search the Internet for answers to what is going on....and so much more. How does an almost 90 year old man survive three serious surgeries? This question kept running through my mind until I finally got the call at 11 something last night that he had, again, battled the odds and successfully made it through another surgery. My world has become a bit blurred as I go through the day unsure of what is to be...living from phone call to phone call on updates that travel through my family like wildfire. I jump everytime the phone rings in anticipation of what the call will bring. But, in the meantime, I wait. While we all made our own individual interpretations of his words...we were in agreement that he wanted me and my sisters to always stay close. Even though I am in Birmingham, my oldest sister is in Atlanta, and the other two are there in West Palm Beach...we have always kept the distance closer by staying in touch with each other and remaining a big part of each other's lives. So, with Dad's words in our hearts, we got together the night before I left for home and made bracelets. 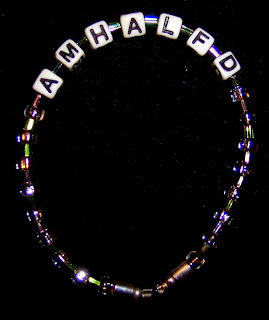 We strung beads and letters together to spell out the acronym: "AMHALFD". Whenever my dad signed anything to my mom, he always ended it with "AMHALFA":"All my heart and love for always". We took this beautiful saying and changed it to AMHALFD: "All my heart and love for Dad". We made our own individual bracelets and vowed to wear these every day until my dad is up and about again. Leaving my dad yesterday was so incredibly painful...but, I had to get back home for at least a while to take care of my "other life" as opposed to this "surreal life" that I have been experiencing in Florida with my family. Between going to Minnesota and then the week in Florida...I had been gone almost two weeks. Mom, my two wonderful sisters, and an incredible brother-in-law, who all live down there within a few blocks of each other....will have to be my link to his every hour as we stay in touch during this period of, hopefully, healing and strength. It is interesting to me to again find how cathartic this simple little blog can be in allowing me to type out some of my most inner feelings as they go from my heart to my fingers. It is as though they need a place to be put...and, it somehow feels right to put them here. This is not a journey that I was prepared for emotionally, but it is a part of the bittersweet life that we all live. Sitting in the hospital and watching my dad take in labored breaths...opening his eyes only on occasion...and being hooked up to a multitude of clicking, ticking and beeping paraphanelia was quite distressing...to say the least. What is he thinking about as he lies there being surrounded by not only machinery but groups of doctors and nurses 24 hours a day? What are the words that he is trying to say to his four daughters who encircle his bed rubbing his cold hands and stroking his thin, grey hair? So, there we were huddled around this brilliant man taking turns holding up his right hand as he attempted to scrawl out some messages to us...all the while trying to decipher what he was trying to say. 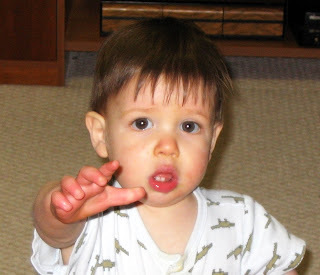 Incredibly, at one point, he was able to let us know that he felt like something was stuck in his throat---he did this by words as well as pictures. He actually did a rough drawing of himself in the hospital bed and then made a line from his head to a larger drawing of his head and neck where he attempted to point to the exact area where his pain was. Of course, we immediately took this information to the nurse who was pretty amazed at what he had done and then assured him that it was a normal sensation....most likely from the breathing tube. Unfortunately, there were times when his words did not seem to make any sense to us...and we had to remember that he was on many pain meds at different times. Words like "paranormal" and "parallel universe" left us a bit confused as well as pondering this spiritual level that his mind was possibly going to...but, we did have to laugh when during one of his "writing sessions" he actually asked us all to be quiet! I imagine that having the four of us plus Mom chatting away can get to be quite overwhelming...!! As I sit at my dad's computer in S. Florida this morning, I felt the need to write a quick update about this last week. It has been an emotional roller coaster of the most difficult kind. Dad is still in intensive care after putting his almost 90 year old body through two serious operations as well as contracting an infection that does not respond to antibiotics. What started as pneumonia then became a severe lung infection that could only be stopped by surgery...a period of beginning to improve until an emergency perforated colon surgery occurred two days ago. At this point we were told by the surgeon that "he couldn't survive without the surgery....and he might not make it through the surgery". Those words will forever ring in my ears. However, as I sit here today, this man of great strength continues to fight...and amaze even the doctors that are taking such wonderful care of him. As of last night, they had removed his breathing tube and he was able to breathe on his own. His vital signs were all good...and the prognosis is looking much more positive. I always knew that my dad was an incredible man....now he has proven himself to be a true warrior. 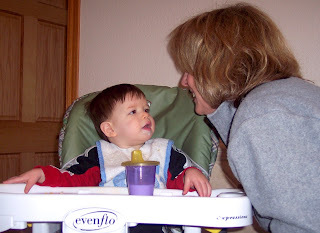 ...so much more to write, my dear blogging friends....but, as Mom and I head to the ICU this morning, I simply ask for your prayers and good thoughts. I'm back from an incredible visit with Owen in MN. But, I am here today and gone tomorrow as I head down to Florida first thing tomorrow morning to be with my family. Unfortunately, on Saturday, my dad had to have surgery to clear up his severe lung infection and I am going to go down there and stay with Mom for a while and visit my dad in the hospital. I have much to tell about my trip and will try and blog while down in Florida....but, for now it is unpacking my heavy winter clothing and packing some light summer clothing....More later.